Bellevue is a new ultra luxury boutique offering by Cressey in Dundarave. These 35 exclusive private residences showcase Cressey’s renowned craftsmanship, illustrating both intelligent design and outstanding quality. 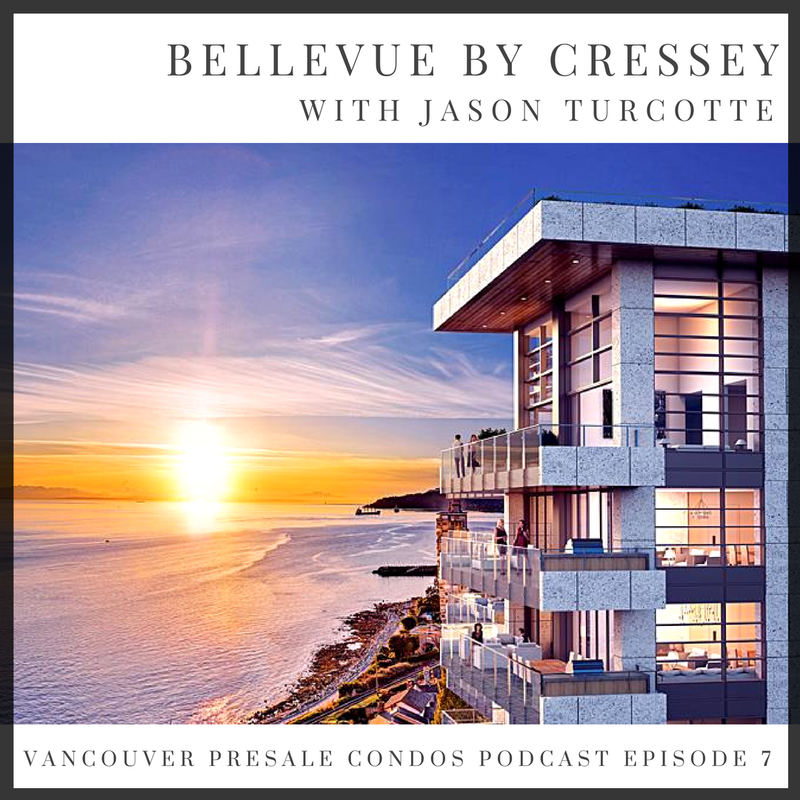 Jason Turcotte, Vice President of Development at Cressey, sits down with Matt and Adam to detail this new and exciting project hitting West Vancouver. Sign up below for more information. The project is in Bellevue, West Vancouver. It is a high-rise, 15-story building of 35, ultra-boutique luxury homes, steps from the seawall and a block from Dundarave Village. The project is unique as it’s so close to retail and the seawall. Units are a spacious 2,000 square feet or larger. Three multi-level townhome units, which include their own elevators (as does the penthouse), anchor the building. The penthouse is on its own floor, and the other floors have either two or three units, so it’s very private. There are two passenger elevators and a third service elevator (for move-ins or move-outs, cleaners, contractors, etc.). The building’s design focuses on maximizing views from as many suites as possible. The views start even from the ground floor, because it’s sloping away and the seawall is right there. What sets Bellevue apart is that it’s a high-rise with relatively low density—there is a tower with a lot of open space. It has a beautiful driveway, and there is a concierge in the lobby. The underground parkade entrance is elegant, finished like a European street with stonework and wall sconces. It feels boutique-residential which resonated with people, especially those coming out of places like the British Properties or non-commercial areas of West Vancouver. There is a pool, steam room and sauna, fitness area, Pilates studio, and elaborate gardens. Why are you excited about the area? When Cressey became the successful bidder on the site, Jason knew it was a once-in-a-career opportunity to work on a project like this. West Vancouver already sets the table, but given the waterfront, unobstructed views with no plans for further development, it was the last significant high-rise site on the west-side of Ambleside. Having Dundarave Village walkable, just a block away, is great. The project created opportunities to think and do things they would never normally do. It’s been interesting to dream and think outside the box. These units are designed for people coming out of large, single-family homes; it may be the last home they purchase. The building was designed for individuals or couples selling, likely in West Vancouver, who understand the neighbourhood and want to be down where it’s flat and walkable to shop, have coffee, and access the seawall. Units start in the low $4 millions and go up from there. Can you tell us more about Cressey? Cressey’s philosophy is to approach every property uniquely. They are a large-scale developer that likes to think they bring the mentality of a boutique builder. Every building is designed from the ground up, from scratch. There is no formula or one-size-fits-all approach. They strive to innovate and provide great value to people through high quality product, great locations, and exceptional customer service at the end. The company will be celebrating its 50th anniversary next year, and they love what they do.